sit in row 2 and faces North. They like different colors i.e. Blue, Green, Grey, Black, Red, Yellow, White and Pink, but not necessary in same order. The one who likes Grey sits 2nd right of G but both do not sit at any extreme end. The one who faces the one, who likes Grey, sits immediate left of the vacant seat of row 1. There is only one person sits between vacant seat of row 2 and J. The one who faces the vacant seat of row 2 is C who likes Yellow. Q1. Who among the following likes White? Who among the following sits 2nd left of the one who likes Green? Who among the following likes Black? Who among the following faces the one who likes Red? How many person sit between G and J? Q6. If these numbers are written with their digits in the increasing order, which number among them will be 2nd lowest? If 3rd digit of 2nd highest number is divided by 1st digit of lowest number, then what will be the final answer? If these numbers are written with their digits in the increasing order, which number among them will be highest number? If these numbers are written with their digits in the decreasing order, which number among them will be 5th lowest? If the addition of last two digits of each number is multiplied by 5 and then subtract by 1st digit, then after doing the operations, how many numbers are odd number? immediate neighbor of E. J does not like HCL. Q11. Who among the following likes Apple laptop? Who sits immediate right of the one who likes HP? What is the position of V with respect to J? Who among the following likes Lenovo? Which is true from the given arrangement? Directions (16-20): In each of the question, relationships between some elements are shown in the statements(s). These statements are followed by conclusions numbered I and II. Read the statements and give the answer. There are seven friends i.e. C, E, F, G, H, I, and J are working in different IT companies viz. TCS, CTS, HCL, Wipro, Google, Microsoft and Infy. They go to company on different days of the week from Monday to Sunday. The one who works in Microsoft goes to office after the one who goes to office on Wednesday. There are two days gap between the one who works in Microsoft and the one who works in HCL. J works in Infy goes to office just before the one who works in TCS.G goes to office on Tuesday. There are three days gap between G and H. The one who works in CTS, goes to office just after the one who works in HCL. The one who works in Wipro goes to office on Sunday. E goes to the office just before I. C does not work in HCL. E doesn’t work in HCL and CTS. 21. Who among the following goes to office on Saturday? Who among the following goes to office just after the one who works in Microsoft? Who among the following goes to office on Wednesday? How many days gap between the one who works in CTS and the one who goes to office on Friday? Who among the following works in Google? ‘laptop Indian each day’ is coded as ‘ngi riy nop hus’. Q26. What is a code of “Indian”? “lne ngi” could be a code for which of the following? Which of the following is the code for ‘Every’? “riy snk mlp” could be a code for which of the following? Which of the following is the code for ‘laptop’? 1st floor, does not like Centro. There are two floors between K and I who does not live below from 4th floor. L lives just above G and the one who likes Ferrari, lives just above the one who likes Ford. K does not like Swift. Q31. Who among the following likes Swift? How many persons live between the one who likes Alto and H? Who among the following likes Ford? Who among the following lives on 2nd floor? Who among the following lives on top floor? 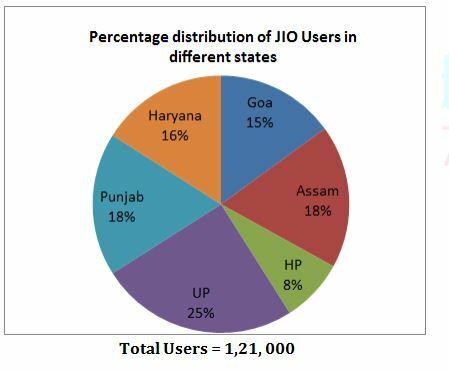 JIO users in Punjab and Assam together is what percent less than JIO users in UP and Goa together. Find JIO users in Gujarat if JIO user in Punjab is 25% less than the JIO users in Gujarat. If Ratio of male JIO users to female JIO users in H.P. is 4 : 7 then find the difference between females JIO users to the male JIO users in H.P. Find the number of Idea users in Assam if ratio between Idea users and JIO users in Assam is 5 : 11. If S is 150% of T, then T is what per cent of S + T ? A, B and C invested their capital in the ratio 5 : 6 : 8. At the end of the business they received the profits in the ratio 5 : 3 : 1. Find the ratio of time for which they contributed their capital ? A sells his house to B at a profit of 10% who is turn sells it to C at a profit of 15% who in turn sells it to D at a profit of 25% and D sells it to E at 35% profit. If cost price of E’s house is Rs. 35,00,887.5 what is the cost price of A’s house ? 15, 23, 37, 60, 95, ? 240, 246, 234, 258, 210, ? 21, 30, 55, 104, 225, ? Directions (51-55): What should come in place of question mark (?) in the following questions? 25% of 1472 + 45% of 960 = ?% of 100 + 80% of 625. A train travels a distance of 600 km at a constant speed. If the speed of the train is increased by 5 km/hr, the journey would take 4 hrs less. Find the speed of the train. Two customers borrowed the same amount of money, one at compound interest and the other at simple interest at same rate of interest. If after 2 years, the interest payable by one was Rs. 220 and by the other Rs. 200, then, what was the principal money lent to each one of them ? A box contains 10 balls out of which 3 are red and the rest are blue. In how many ways can a random sample of 6 balls be drawn from the bag so that at the most 2 red balls are included in the sample and no sample has all the 6 balls of the same colour ? What is the probability of getting a sum of 6 when two dice are thrown simultaneously? Directions (66-70): What should come in place of question mark (?) in the following questions? Directions (71-80): Read the following passage carefully and answer the questions given below them. Certain words/phrases have been printed in bold to help you locate them while answering some of the questions. when the current recessions ease and the economy gradually comes back on the fast track. The finance minister has assured Indian public about the sound health of the Indian banks. This could also be evident from the fact that there have been no mergers and takeovers in Indian banking sector in a contrast to world scenario where finance houses are looking for mergers to cut costs on operations. We definitely are not looking to thrive; rather we are looking for growth. It is just that the pace of growth is a little slow now as compared to a year or two before. These are hard times to test the hard. The weak in business and career will be weeded out and it is sometimes very beneficial for business in the long run. Q71. What, according to the author, is the reason for the success of Indian national banks in this quarter? Indian national banks do not have any commitments in troubled foreign markets. These banks can never financial crisis because of their sheer size. The public is ready to invest in these banks because of the knowledge that these banks get strong support from the Government. What does the phrase ‘shot in the arm’ as used in the passage mean? How, according to the author, is the current recession beneficial? Worldwide companies have realized that India is a strong power to reckon with. India is surging ahead of the other companies throughout the world. After the recession is over international companies will turn to India for investment. Recession is bringing down the prices of essential commodities. What, according to the author, will be a big boon in the days to come? Which of the following statements is/are definitely true in the context of the passage? I. India has not been affected by the economic slowdown. II. India banks are showing growth in this quarter despite the recession. III. While banking industry in the West was severely affected by recession in the past, it is now gradually recovering and showing a positive growth. Which of the following strengthens the finance minister’s statement about the sound health of India banks with respect to the passage? (i) There have been no acquisitions and mergers of Indian banks. (ii) The Indian banks are recording a positive growth. (iii) Layoffs have been observed worldwide. Directions (77-78): Choose the word/group of words which is most SIMILAR in meaning to the word/group of words printed in bold as used in the passage. Directions (79-80): Choose the word/group of words which is most OPPOSITE in meaning to the word/group of words printed in bold as used in the passage. Directions (81-85): Rearrange the following six sentences (A), (B), (C), (D), (E) and (F) in the proper sequence so as to form meaningful paragraph and then answer the questions given below them. A. What is important is sincerity and good faith. B. One is sure that people in general are fed up with strife and want an end to this. C. The Centre will have to be prepared to take harsh steps too. D. The steps the Centre is taking to try to bring peace to the troubled Kashmir Valley are to be welcomed. E. There have to be attempts to create a cordial atmosphere among different factions, political or otherwise, in Jammu and Kashmir and between the Centre and the State. F. The ball must be kept rolling and there are bound to be positive results if efforts are made in right earnest. Q81. Which of the following should be the SIXTH (last) sentence? Directions (86-90): Which of the phase (A), (B), (C) and (D) given below each sentence should replace the word/phrase printed in bold in the sentence to make it grammatically correct? If the sentence is correct as it is given and ‘No correction is required’ mark (E) as the answer. Q86. A freezing morning accompanied by a dense cover of fog set the toning for the coming weekend. The jail is in the news again with the finding of a postal and some bullets. The space-crunched city throws up several stories of struggle that school have had put up with to win playground for their students. Emotions was high as both families were taken to the police station last night. Work at all the court complexes was paralysed as lawyers went on a day-long strike as a mark of protest. Directions (91-100): In each of the questions given below a sentence is given which is divided into 5 parts. The first part which is numbered (1) and is grammatically correct. You have to find the error in the other numbered part of the sentence and if you find the error in any part of the sentence apart from (1) then that part of the sentence is the correct choice for the given question. If all the parts are grammatically correct choose option (E) as your choice. With a sharp rise in the number of /(A) large-scale financial crimes, / (B) the CBI and Indian Institute of Management have initiated / (C) the first-of-its-kind course to train sleuths / (D) from the CBI to probe financial frauds. / (E) No error.